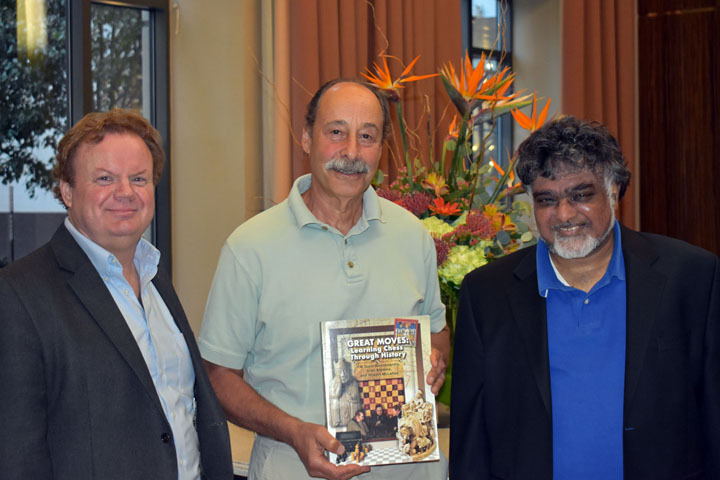 FIDE Master Sunil Weeramantry is a pioneer in the field of curricular chess instruction and a nationally acclaimed instructor with over 40 years’ experience teaching and developing award-winning chess programs. Beginning in 1979, Sunil developed a comprehensive chess program at Manhattan’s Hunter College Campus Schools, a leading laboratory school for talented and gifted students, where chess is a required subject for all students in kindergarten through fifth grade. Founder and Executive Director of the National Scholastic Chess Foundation, he directs programs at over seventy other schools as well as community programs in the greater New York City area and instructs teachers on how to teach chess at workshops across the United States. Sunil served as Chairman of the Chess in Education Committee of the United States Chess Federation for 10 years and continues to be an advocate for the broader benefits of chess. A two-time New York State Champion, Sunil is better known these days as the stepfather of GM Hikaru Nakamura, one of the world’s elite grandmasters. Sunil is the author, with Ed Eusebi, of Best Lessons of a Chess Coach (Random House, 1993). Alan Abrams is a lifelong chess player who built, then sold, a successful retail business. Rather than retiring, Alan began teaching children the game he loves. From 1997 through 2012, Alan led public- school chess programs at PS291 and MS15 in the South Bronx. He soon turned underprivileged children, most of whom had never even seen a chessboard, into national champions. Featured in numerous newspaper and magazine articles, Alan has helped hundreds of youngsters who were struggling in the classroom to find enthusiasm for learning and educational success. Much of Alan’s methodology has been predicated on an approach he developed called “Chess Literacy,” whereby students learn the game in concert with improving their literacy skills and their appreciation for history and culture. Alan received his MA in Psychology from The New School for Social Research. He teaches chess at schools in New York and Connecticut as well as for private clients. Robert McLellan first became interested in chess as an education tool while working as Executive Producer for the award-winning documentary film Brooklyn Castle. He later spent two years as marketing director for the United States Chess Federation before joining the National Scholastic Chess Foundation. At NSCF, he develops and manages teacher training programs in addition to marketing and development responsibilities. Robert’s professional career includes marketing projects for non-profits and Fortune 500 companies. He has produced records, concerts, commercials, and a television series; written for national magazines; and co-authored a best-selling book on high-stakes poker. For over 20 years, he taught in and directed community-based literacy programs in Halifax, Nova Scotia and Los Angeles, California.